With regret, we would like to announce that JPO2 (CIQ 2nd Link <-> Legoland <-> Sanrio Hello Kitty Town & Thomas Town <-> Johor Premium Outlets <-> Senai Airport) bus servicelast day of operation will be on30 April 2019 (Tuesday). Thank you for your support and sorry for any inconvenience caused. Please be informed that our JB-Mersing and Mersing-JB express bus timing will be revised effective on 8 April 2019 (Monday). Customers can purchase the bus ticket via online from www.causewaylink.com.my or from the nearest ticketing counters. With regret, we would like to announce that BX6N/BeXTRA6 (Setia Indah <-> Bandaraya JB) bus service last day operation will be on 31 March 2019 (Sunday). As an option to travel between Setia Indah and Bandaraya JB, passengers may take 10B bus service. With regret, we would like to announce that SL1 (TUTA Terminal <-> CIQ 2nd Link) bus service last day operation will be on 31 March 2019 (Sunday). To travel to TUTA Terminal and Sutera Mall, passengers may take CW3S which will be operated daily. of Mall of Medini premise is closed until further notice. Due to the Batu Pahat Bus Terminal renovation, effective from 1st March 2019, the pick-up and drop-off point for Batu Pahat Express Bus Service will be relocated inside the bus terminal building. Please see attachment. Thank you. Please be informed that Land Public Transport Agency has ordered all private ticketing counters at Melaka Sentral to cease operation effective on 1st March 2019. Centralized Ticketing System (CTS) will be fully operationalized at Melaka Sentral as such Causeway Link system will be migrated and integrated with this CTS. However, customers can still take Causeway Link buses from Melaka Sentral. 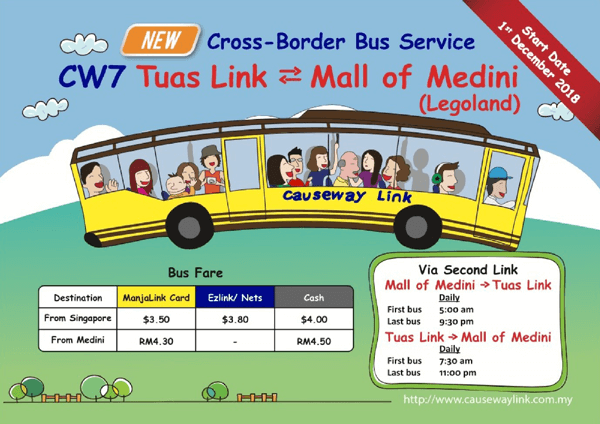 Bus ticket can be purchased via online from www.causewaylink.com.my or from the CTS counter and self-service machine available at Melaka Sentral Bus Terminal. Sorry for the inconvenience caused and we sincerely hope you will continue to support us by choosing our bus service to travel from and to Melaka Sentral. Thank you. Join us with our Comment & Win Contest and stand a chance to win 2 adult admission tickets of Desaru Coast Adventure Waterpark and two round trip tickets of Causeway Link Bus DSX between Senai International Airport and Desaru Coast. "I want to go #DCAWP with #CausewayLinkBusDSX during this Valentine's Day"
Step 3: Gather as many replies as you can. Most replies win. So let the TAGGING MODE on. Contest Period: January 21 to February 11, 2019. This contest follows the rules and regulations as well as the mechanics of this social media contest. Entries using advertising or offensive words or any articles, or that violate any laws are STRICTLY NOT allowed. The organizer will disqualify entries if any of the entries deemed to be inappropriate. One comment is allowed for each participant. Selection of winners will be based on the most accumulated replies on the main reply. The announcement of winners: February 14, 2019. Published winners are considered final. Participant below 18 years old is not allowed to join these contest. This contest is for Instagram users only. This contest follows the rules and regulation of Desaru Coast Adventure Waterpark and Causeway Link Management. These terms and conditions maybe change from time to time without advance notice. Desaru Coast Adventure Waterpark Ticket is valid from 21st January –to 30th April 2019. Bus service between Desaru Coast and Senai International Airport Ticket is valid from 21st January –to 30th April 2019. Generated code must be for ONE TIME use only. Customer MUST book the ticket and use the Promo Code. Customers will be contacted via Instagram messaging on their winning prices. Winners will not be entitled with free gifts (from Bus DSX bus service). No Loyalty Point redemption, change ticket and booking is available for express bus service (all routes) for trips on 01/02/19 to 10/02/19. To all valued passengers, please be informed that effective on 1st December 2018, bus fare from Mall of Medini and Legoland to Singapore (Jurong East, Boon Lay and Tuas Link) will be revised as follow. Kindly prepare exact fare. Thank you. Good news to all Cross-Border passengers! Effective 1st December 2018, we will be running our CW7 cross-border route between Medini, Iskandar Puteri with a drop-off and pick-up point at Mall of Medini and Tuas Link, Singapore at an interval of 10-15 minutes. JOHOR BAHRU MALAYSIA: Causeway Link will officially launch CW7 cross-border route between Malaysia and Singapore on the 1st of December 2018. The new route will be running between Medini, Iskandar Puteri with a drop-off and pick-up points at Mall of Medini and Tuas Link MRT Station, Singapore at an interval of 10-15 minutes. CW7 bus service travelling time will take approximatelyhalf an hour to one and a half hours between Mall of Medini and Tuas Link MRT, Singapore depending on traffic condition. With the connectivity of CW7 from Johor Bahru, Malaysia to Singapore, commuters can use the MRT Link (green line) to travel to Central Business District (CBD) of Singapore with the MRT Circle Line, which include the City Hall, Raffles City, Downtown, Tanjong Pagar, Botanic Gardens, Bishan, Marina Bay, Orchard City, Buona Vista, Chinatown, Dhoby Ghaut, Serangoon, Changi Airport and others. For commuters coming from Tuas Link MRT in Singapore, they can be connected to go to thevarious places of interests in Johor Bahru such as LEGOLAND Malaysia Resort, Mall of Medini, Sanrio Hello Kitty Town and Thomas Town, Johor Premium Outlets, Senai International Airport and other shopping centres like Giant Nusa Bestari, AEON Bukit Indah and Sutera Mall. Previously, some commuters walked into the Tuas Checkpoint posing a safety and security threat as Immigration and Checkpoints Authority (ICA) Singapore prohibits commuters to walk along the Second Link CIQ Causeway. “With this new connecting point at Tuas Link, we can avoid this from happening as there is now a close and convenient point to travel to Tuas Checkpoint” added by Ms Lim. Stand a chance to get a pair of Sam Hui & Alan Tam Happy Together World Tour Tickets worth SGD416/RM1256.32 during Causeway Link roadshow event promotions. The roadshow is available on the 17th, 18th, 24th & 25th of November 2018 at the City Square Johor Bahru (Ground Floor Atrium) from 10am – 10pm. Sam Hui & Alan Tam Happy Together World Tour is their first time to perform together in Singapore and to be followed Malaysia, following a successful run of their joint Happy Together concert series in Hong Kong over the past year. Free tickets are only available during the Causeway Link School Holidays Road Show at City Square. Each Customer who spend a minimum of RM200 and above in a single day on any of the Causeway Link/ ManjaLink/ Causeway Link Holidays products and services such as ManjaLink top-up, new card purchases, merchandises or theme park ticket purchased are entitled to get 1 pair of a standard tickets worth $416 (RM 1,256.32). Each customer is entitled to a maximum of one pair concert tickets only. Tickets are valid for the Sam Hui & Alan Tam Event in Singapore Tour (1/12/2018) only. Free tickets are not exchangeable to cash. Causeway Link follows the Terms & Conditions stated by the organizer of the Sam Hui & Alex Tam Happy Together Live Concert in Singapore on 1/12/2018. Causeway Link reserves the right to cancel, change or refund all purchases made. Any decision made by the Management of Causeway Link in this regard is considered final and binding. Other terms & conditions in this regards are published at the announcement page of Causeway Link Website. Please take note that in conjunction with Larian Obor Asia Pacific @ Iskandar Puteri, bus stopping point in front ofMall of Medini premise will be closed on 30th July 2018 (Monday) starting from early morning until 12 noon. As such, during the said period, our buses’ pick-up and drop-off point will be at a bus stop which situated beside Mall of Medini (please see photo).Commuters can check with our counter staff at Mall of Medini for any further assistance. Thank you. July 19, 2018 marked the day for the Soft Opening of the bus service operation of Causeway Link Express bus services between Senai International Airport (SIA) and Desaru Coast, Johor, Malaysia. There are two pick up points for this bus services. Passengers from Senai International Airport are required to proceed at the Causeway Link Counter inside Senai International Airport to buy their bus tickets and also to exchange e-tickets (which was purchased online) into a boarding pass. The buses will wait at the bus bay area for 15 minutes before departure time. Hence, passengers are advised to be at the pick-up point at the airport at least 30 minute before departure time. Whereas, for the pick-up point at Desaru Coast, the bus will be waiting from the drop off points just near the Riverside of Desaru Coast. Passengers must be able to be at the pickup point inside Desaru Coast at least 30 minutes before departure time. 1. The introductory promotion of this bus services will start from 19th July to 14th October 2018. The express bus services for this route is a 29-seater high deck luxury buses. The seating arrangement is very luxurious and it has leg room for the passengers to rest their feet. The buses have also Free WiFi and have conducive air conditioning facility. This bus services have also included Lotus Desaru Beach Resort & Spa, Sand & Sandals Resort & Spa Desaru Beach, and Tunamaya Beach & Spa Resort Desaru Coast as an additional drop off point for passengers coming from Senai International Airport to Desaru Coast Only.